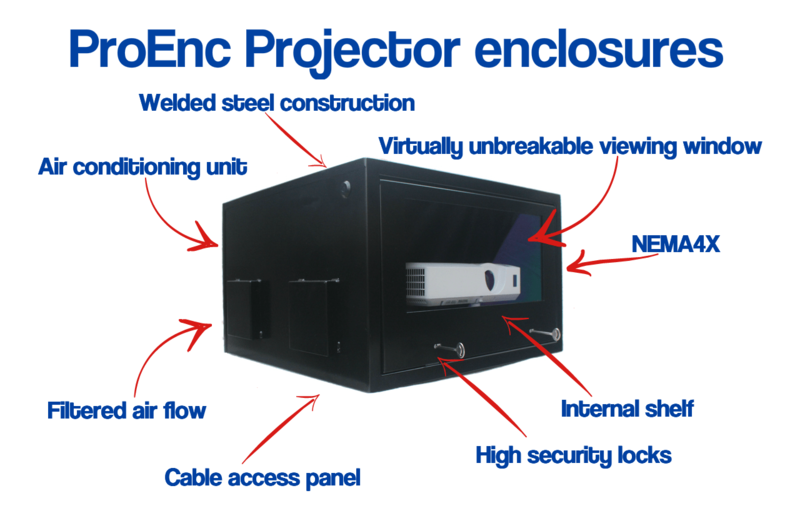 ProEnc’s bespoke projector enclosures are in high demand, as more and more clients have a need for a custom built solution not a cookie cutter solution. The challenge has been to provide a custom built enclosure at an affordable price and now ProEnc are offering this. Challenges of bespoke projector enclosures. Usually the unit is a single unit as a prototype, so many businesses who are not a manufacturer move away from these single enclosures, as they require a lot of time to design and get approval for and normally the lead time is long too! Video conference call to show the custom built projector enclosure before it’s fully welded and painted. So let us look at each stage so clients can understand the entire process. Not all projects are the same and this is the main reason why ProEnc offer this service. It may be the mounting of the enclosure or the additional hardware that’s needed for the project. So once ProEnc has discussed the project and what hardware will be used, they design a solution using CAD software, detailing all the hardware inside the casing or specific mounting points. The CAD drawing is then submitted to the client for approval, if everything is correct the drawings are approved and then the unit is put into production. Manufacture of bespoke projector enclosures. Here ProEnc takes the flat sheet sheets and laser cuts any cut-outs in the panels, the next process is bending and the unit is then tack welded together. Client a chance for any last minute changes to design. Once everything is good, we move on to the next step. This is the final part of the manufacturing process, once fully welded and painted; this can be in any standard RAL colour as part of the bespoke solution the custom built projector housings are then packed ready to ship. Once the client has taken delivery of the bespoke housing, it is then kitted out with the hardware and then tested to make sure it performs as required. This can take between 2 weeks and 5 months. If nothing needed changing and with the final tests completed, the client contacts ProEnc and instructs them to proceed with the quantity production of the customized projector enclosures. You can contact ProEnc today on (862) 234-5981 and discuss your requirements for your specific project and discuss what options you need for your bespoke projector enclosures.